Hôtel de Sully is one of my favourite places in Paris. In spring, birds make full use of the ivy-clad walls to nest. At this time of year, the courtyard is full of birdsong and the hungry cries of baby birds. History permeates this quiet and peaceful space in the heart of the Marais. It was built in the late 1620s as a Hôtel Particulier, or private mansion, for the financier Mesme Gallet. Soon afterwards Henry IV's former surintendant des Finances, Maximilien de Béthune, duc de Sully, acquired it. At quiet times, like the one above, it has a still, ghostly air and makes you feel that you wouldn't be a bit surprised if M. Gallet were to appear in the doorway. These days Hôtel de Sully is a state-owned monument historique. You'll find the entrance on the busy rue Saint-Antoine, close to Métro Saint-Paul. In one corner of the building there's a lovely tranquil gallery where some fantastic photographic exhibitions are curated. Walking out of the other side of the courtyard takes you into the historic Place des Vosges. On this spring visit, a short walk from Hotel Sully, I came across Comme à Lisbonne on rue du Roi de Sicile (parallel with rue de Rivoli). Instantly recognising the name from one of David Lebovitz's excellent posts on his Paris-based blog I stopped off for, coffee. The shop is tiny but has a couple of stools where you can perch. They offer one of the best Pastéis de Nata I've ever tasted. The pastry was not quite the one I expect from this little Portuguese custard tart - maybe this is because the baker hails from the Azores rather than mainland Portugal - but it was undeniably good. The custard filling was all the more delicious for not being thickened with cornflour, as is the norm. The baking is done on the premises. Fresh batches of tarts regularly arrive from the kitchen and there is an optional sprinkle of canelle (cinnamon). The owners are charming and the take away trade is brisk. Apart from stocking a small handful of Portuguese products, that's all there is to it - and it's all the better for it. I'll definitely be returning. Another find on this trip was a small, unassuming place on rue Oberkampf called Aux Deux Amis. Serving natural wines at reasonable prices this neighbourhood cafe bar proved well worth seeking out. Lunch was over by the time we got there but its aroma lingered enticingly. I noted that it would be a good place to try for lunch on a future visit. On this occasion it was a welcome pitstop and reminder of genuine 60s cafe style. 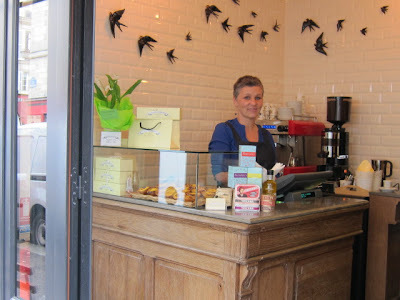 I still haven't had my fill of Pierre Cluizel's chocolates at Un Dimanche a Paris, which I've written about previously. A cup of hot chocolate as you browse the chocolate, pâtisserie and glaces is a must. The shop's a two minute walk from Métro Odéon on Cour du Commerce Saint-André in the 6th arondissement. Take care not to turn an ankle on the the ancient cobblestones. A ten minute stroll from here to the stylish rue Bonaparte brings you to Pierre Hermé's fantastic pâtisserie. Although you can buy Hermé's macarons and chocolates in London now - from Selfridges and a Pierre Hermé shop at 13 Lowndes Square SW1 - to taste his baked goods you have to go to Paris. 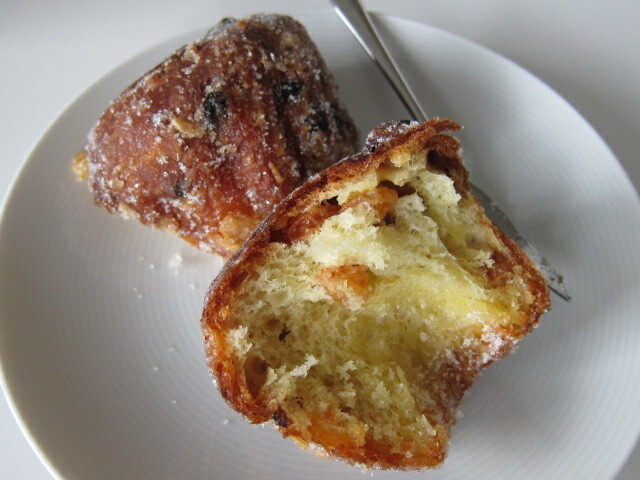 If you can bring yourself to disregard the fabulous pâtisserie, walk to the back of the shop to seek out an individual Kugelhopf. Fluffy, coated with sugar syrup and spiked with excellent quality fruit, it is outstanding baking. 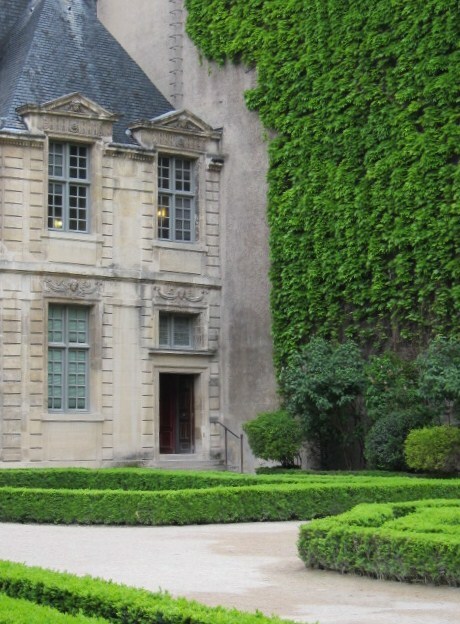 Take it to the nearby Luxembourg Gardens and enjoy amongst the collection of apple, pear and vines.